Natsume frees more spirits - and deals with more humans too - in Natsume's Book of Friends Volume 2. Note: Natsume's Book of Friends Volume 2 is, of course, the sequel to Natsume's Book of Friends Volume 1. 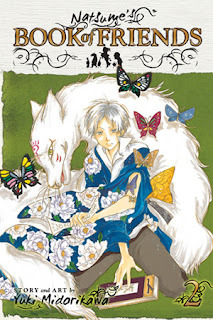 The review of Natsume's Book of Friends Volume 1 is here. Otherwise, read on! Perhaps it makes a certain kind of sense that Volume 2 would start out with a fairly traditional haunted house story. In 'The Spook in the Old Schoolhouse,' the spirits are trying to keep their house from being demolished, but in the tradition of teenagers everywhere that simply makes it the perfect place to scare people. This time, though, the spirits are real and have no problem taking out a few teens that are in their way. Will Natsume, and a girl with a connection to one of the spirits, be able to rescue their friends from oblivion and put the spirits to rest? In 'Natsume Summons a Yokai,' Natsume stumbles across a spirit chained to a tree. He ends up with a five-day mark on his arm, which the confined yokai can use to steal a victim's lifeforce without having to be there in person. We meet a spirit named Hinoe, who had a special connection to Natsume's grandmother but hates men,. Natsume also summons back Misuzu, the spirit whose name he didn't give back in Volume 1, and it turns out that he doesn't mind being summoned by humans. Will Natsume, with the help of his yokai allies, be able to remove the five-day mark and keep the bound yokai from escaping? In 'He Can See,' we meet actor Shuichi Natori, an actor who can see yokai as well. A pawnbroker raided a storehouse, and the yokai who guard the items within began to haunt the pawnbrokers. Shuichi is already on the case, but the way that he exorcises the spirits causes them pain. Will Natsume be able to show Shuichi a more humane way to deal with these spirits, who are just doing their job? Finally, in 'Asagi's Lute,' Natsume is accosted by a parasol-wielding Akagane. He is the parasol-holder for Asagi and several other women who are the concubines of a lord. As she fell ill, she slowly lost the ability to play the lute. Akagane wished for Asagi to be able to play the lute one more time for their lord and helped Asagi enter Natsume's body to be able to once more. Will Asagi be able to play one last song for her beloved? With this volume, it seems like Midorikawa is finally getting used to the episodic nature of the series. Reintroductions at the beginning of each chapter are getting shorter and shorter, and while each story is still self-contained, there are a few recurring faces starting to gather and that creates some continuity between chapters. The premise of the series is still very open-ended, and while a few themes are stiarting to appear, there is still plenty of room for the series to grow. Natsume is starting to warm to a few people to go along with the yokai that have been a part of his life so far, and since apparently some of them can see these spirits as well, perhaps Natsume's future won't be so lonely after all.